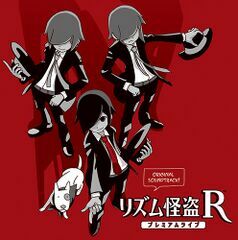 Rhythm Kaitou R Premium Live Original Soundtrack (リズム怪盗R プレミアムライブ Original Soundtrack) is an album featuring music from Rhythm Kaitou R: Koutei Napoleon no Isan. It was also released as a digital download on iTunes and Amazon, with individual tracks costing ¥150, £0.79 (£0.99 on Amazon), €0.99 (€1.29 on Amazon) or US$0.99. EN: Bite the Slapstick Police!